Following the bombshell that concluded ‘Cold Blood,’ Doctor Who wisely slows things down and offers a more character-driven piece that steps aside from the underlying mysteries of this series, in the process delivering another wholly entertaining and deeply satisfying episode. The Doctor, presumably in an attempt assuage his conscience over the seeming death of Rory, is spoiling Amy, picking up at the Museum d’Orsay in Paris. 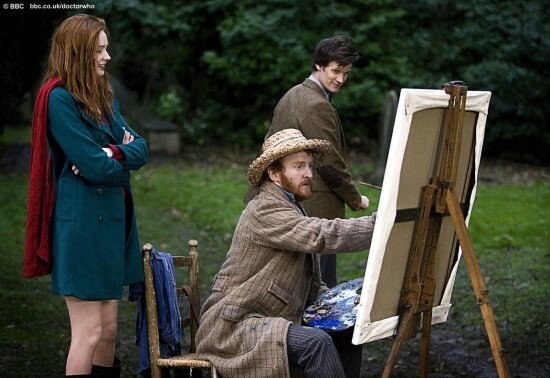 While Amy has clearly forgotten that Rory ever existed, there are very strong implications that that is not the case for the Doctor, but it’s a strange shadow- one the Doctor senses is evil- within Vincent van Gogh’s painting The Church at Auvers during this innocent trip that provides the impetus for another adventure. Once more, vision becomes a central concept within a Doctor Who story, following in the paths of not blinking with the Weeping Angels and looking out of the corner of the eye for Prisoner Zero. Here, though, it’s van Gogh who proves to have a greater visual acuity than others, seeing a great range of things that others simply cannot. While this applies to the villain of the piece, it is best exemplified as the Doctor and Amy lay alongside Vincent while the night sky is transformed into his famed Starry Night. And it truly is Vincent who steals the show. The van Gogh on display is a mentally fragile one, angry at this situation in which he finds himself and almost completely devoid of any means to support himself. This tale clearly takes place not long before his suicide, and the means in which the script touch upon mental illness and depression is a fascinating one without being overly burdensome. The visual of seeing so many now-famous paintings laying around his home is a striking one, consistent with the overwhelming quantity of work that he produced during this time, and although some of the other facts about his life are meshed together for storytelling purposes, this is a superbly sympathetic character who hits all of the right notes and amply drives the drama along. The Krafayis, the monster seen in the window of the painting, proves to be quite an intriguing concept that proves to be more layered than the initial evil force he is presented as. While it is invisible to all but Vincent and is killing villagers, for which Vincent is getting the blame, it is revealed to be blind and lost, acting more out of fear and confusion than spite and hatred. Through all of this, though, the Krafayis more of a placeholder, a means to drive the exploration of Vincent and his motivations and situations along. The identification of its species with one of the Doctor’s limitless gadgets also proves important while giving another nod to the Doctor’s previous incarnations. Yet when Vincent kills the beast with several minutes of running time to spare, it’s clear that there is going to be another extended coda, and writer Richard Curtis certainly delivers one full of pathos and sympathy. The revelation back in the present that van Gogh still committed suicide despite knowing his lasting legacy is a stark reminder that the Doctor is not superhuman, a being who always wins and changes events for the better. He is simply a man trying to do his best, sometimes succeeding and sometimes not. Human nature is a force all unto itself, and sometimes the best intentions are ultimately fruitless. The dedication of the painting to Amy and the utterly sublime cameo by Bill Nighy are simply the proverbial icing on the cake here. For a story that ultimately is a standalone tale so late in the series, it provides one of the best explorations of the central protagonists to date. While its monster proved to be more of a means to an end rather than a central threat, ‘Vincent and the Doctor’ is assuredly going to be remembered for Tony Curran’s heartfelt performance as the doomed artist as well as the inspiration in both the Doctor and Amy he achieves.